We all know westerns when we see them — cowboy hats and the lack of cars are among the giveaways. But the best westerns are good, human stories that just so happen to be set in the Old West. And once in a while, there are comedies that just so happen to be set in the Old West. I’ve been O.D.ing on the Duke lately — what else is knew? — and I’ve always been charmed by two of John Wayne’s films that are flat-out comedies masquerading as westerns. One is even a romantic comedy. Whaddaya know? The Duke made a romantic comedy. But he disguised it well. He gave it a title that sounds like a typical John Wayne vehicle, and wears a cowboy hat, although strictly speaking, this is not a western. So where does the “rom” in “rom-com” come in? 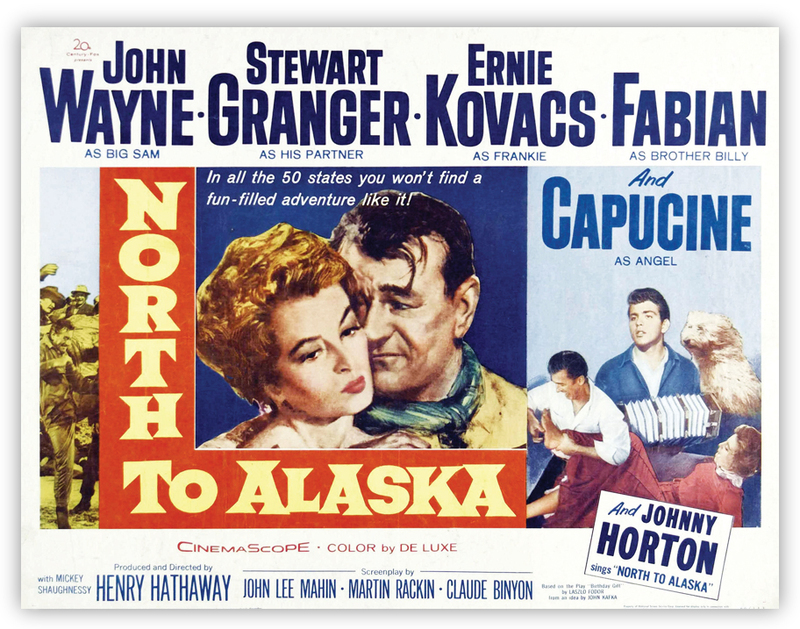 The Duke’s screen persona idles at sexist, but in “North to Alaska,” he’s an unabashed stinker. As Sam McCord, a gold prospector who strikes it rich, he prefers to enjoy the services of prostitutes over, God forbid, getting married. “Any woman who devotes herself to making one man miserable, instead of a lot of men happy, don’t get my vote,” is one Sam-ism. Sam’s partner, George (Stewart Granger), is the opposite; George pines away for his French fiancée, Jenny (Lilyan Chauvin). After striking gold, Sam is dispatched to Seattle to fetch Jenny, while George stays behind to guard their claim. But Sam — who doesn’t trust women, remember — finds his worst assumptions validated: Jenny has married another. A butler, at that. En route back to Alaska, Sam makes a pit stop at a brothel. Surrounded by cooperative professional ladies, he can’t take his eyes off the least willing, Angel (a luminous Capucine). Noting Angel’s French accent, which is similar to Jenny’s, Sam hatches an iffy scheme: He’ll tote Angel to Alaska as a substitute bride for George. The film, by Henry Hathaway (who later guided Wayne’s Oscar-winning turn in “True Grit”), looks gorgeous and the cast, topped off by Ernie Kovacs as a cigar-chomping cad in fancy suits, sparkles. There are upstarts like Fabian, but movie buffs will appreciate seeing the veteran character actors Wayne always packs into his films: Mickey Shaughnessy, doing his best drunk; Joey Faye, doing his sneeze bit; and pug-nosed Joe Sawyer, a welcome sight as a no-nonsense judge in his second-to-last film. He loves a good game of chess. He’s a tall, rich, powerful man accustomed to giving orders. He drinks. He brawls. His marital failures are a torment that he endures in public. When fallout occurs, his friends can only shrug. I’m talking about the character G.W. McLintock in the 1963 John Wayne movie “McLintock!” But I might as well be talking about its star. 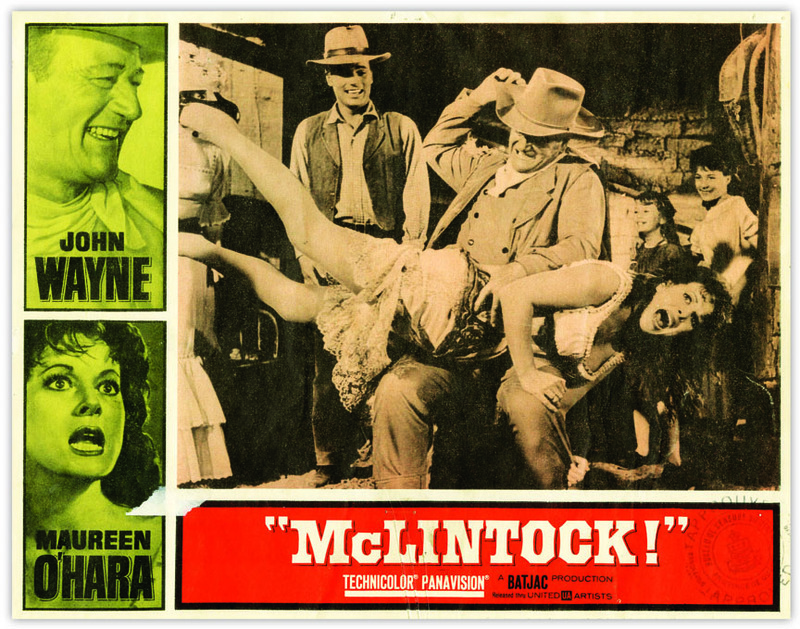 “McLintock!” is a comedy — the mudslide brawl alone makes this plain — directed by Andrew V. McLaglen (son of frequent Duke co-star Victor), who could not unfairly be called the Duke’s functionary. In Scott Eyman’s exhaustive “John Wayne: The Life and Legend,” you get the sense Wayne could only truly be challenged by the old guard: John Ford, Howard Hawks, Henry Hathaway. Wayne was settling into a formula that served him well throughout the ’60s: good production values (though shooting under budget and ahead of schedule wasn’t uncommon), old cronies and young talent — albeit, young talent that was always aware it was sitting at the kiddie table. “McLintock!” may be a sometimes silly movie that coasts on Wayne’s charm, but it’s the cinematic equivalent of comfort food. And what a cast: Maureen O’Hara as G.W.’s fiery estranged wife; Stefanie Powers as their sheltered daughter; Jerry Van Dyke as a goofy suitor; Chill Wills as G.W.’s fretful wingman; Edgar Buchanan as the town vagabond; Yvonne De Carlo as O’Hara’s imagined competition. The protracted climax — in which the entire town cheers as Wayne gives O’Hara a good spanking — is best explained by a psychologist.